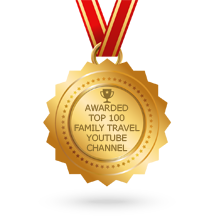 Chic Family Travels decided to ditch the kids and travel to the Abacos in the Bahamas to remember what it was like to travel without $300 in airline baggage fees. 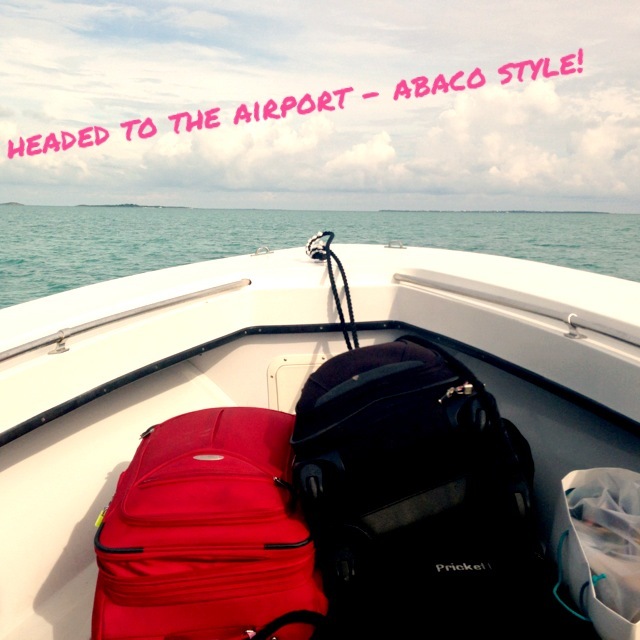 Seriously, we did travel to the Abacos for 5 days with only two carry on bags. Even Daniel was impressed that I was able to narrow down my packing to a carry on bag. In the planning stages, we had some difficulties in figuring out how to get to the Abacos in the off-season. Apparently, the Abacos essentially shuts down in September and October and so do the commercial airlines! We could not find a commercial flight that did not involve a 24 hour plus layover, so we opted for a private charter. We used Noble Air and highly recommend their charter services to the Abacos! 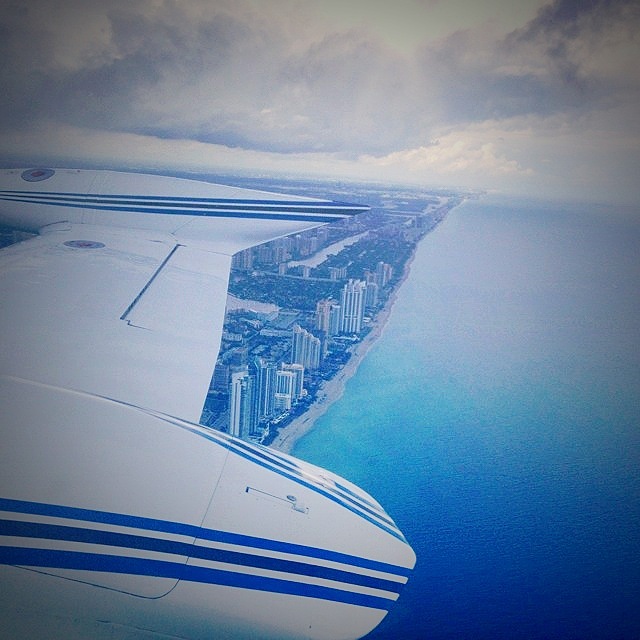 Check out our view headed out of Miami to Marsh Harbour. We traveled with another couple who are friends of ours, and luckily had a prescription for Zanex because I was a wreck prior to boarding this tiny plane. However, we made the best of the situation and the magic pill along with a bottle of champagne eased my nerves. We landed safely, but our adventure in the Abacos required a little more than a commercial flight and private charter. We also had to boat to the little island in the Abacos, Lubbers Quarters, that we chose to spend our 5 days. Now, I admit that we are boaters so this was not that challenging of a situation but it might be for someone who is not a boater. There are ferries into some of the larger islands like Hopetown, but not Lubbers Quarters. 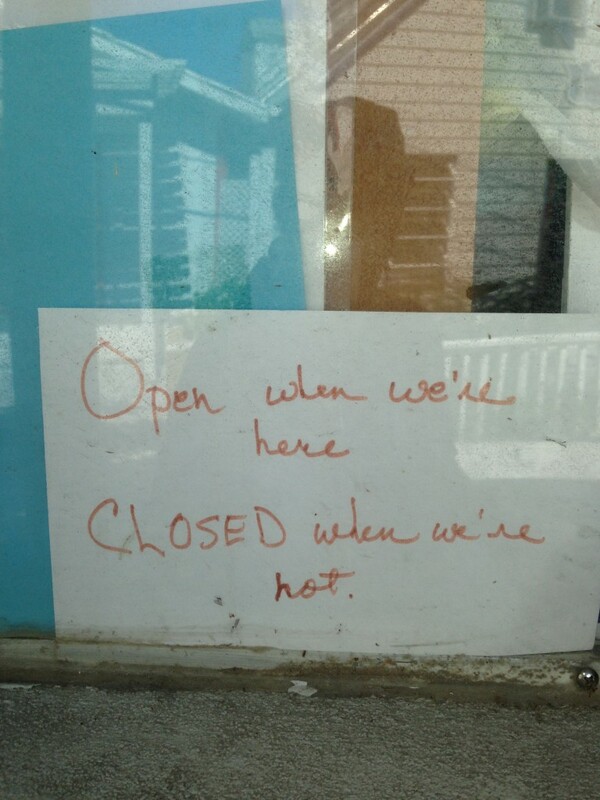 Thus, you might want to take that into consideration when booking your Abacos vacation. Which leads me to my #1 thing to do in the Abacos Bahamas. Honestly, if you don’t like boating then you probably should skip the Abacos because it is one of the main reasons that the Abacos is so much fun! The only way that I know how to explain the Abacos for those of you who are not familiar with the chain of Bahamian islands, is that it is akin to the British Virgin Islands yet still undiscovered and far less commercialized. We found this characteristic of the Abacos charming, and apparently so have the likes of many famous people as we discovered on this trip. We stayed on Lubbers Quarters at Lubbers Landing which also has a restaurant and bar. 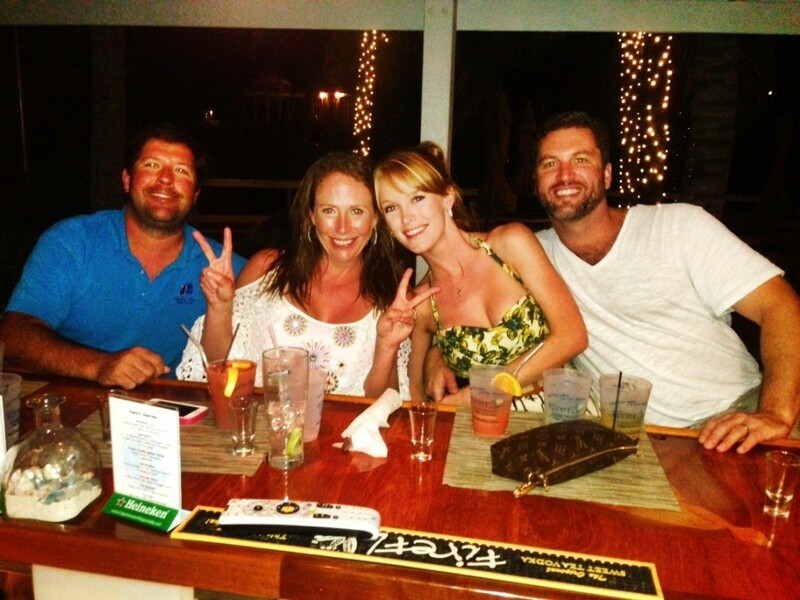 I would recommend a stop at Lubbers Landing for a drink or dinner while staying at the Abacos. This charming restaurant and bar is owned by Austin and Amy, a husband and wife team, who literally live above the restaurant. If pull up and don’t see anyone, just knock on the piling….seriously. 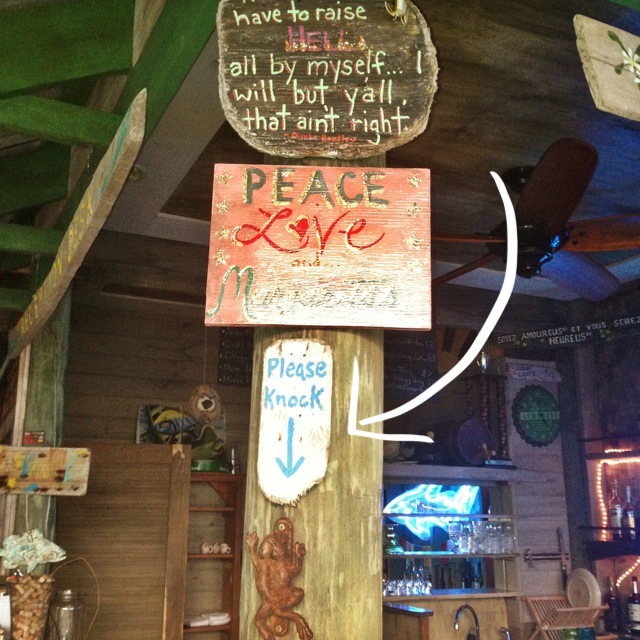 Lubbers Landing serves lunch, dinner and is a “must do” in the Abacos. 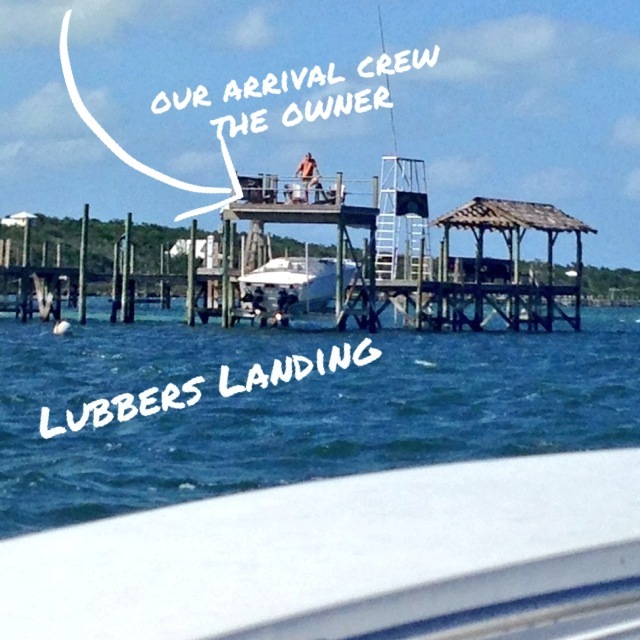 If you are traveling by boat, which you will be unless you are a really strong swimmer, look for the Lubber’s Landing sign. Austin was waving for us upon our arrival. That is a greeting my friends! If that is not enough to convince you that this place rocks, then ask Richard Branson what he thinks of the joint. The king of island-hopping himself recently dropped by Lubbers Landing in the Abacos. There are so many places you can visit by boat in the Abacos that many of my following recommendations are island-hopping stops in the Abacos. Hopetown is one of the most well-known islands in the Abacos chain and is home to the famous candy-striped lighthouse that you can climb to the top. Hopetown is a quaint Bahamian town where you will find far more golf carts than cars and friendly locals. A friend told me that I had to find “Vernon’s Grocery,” because they have the best key lime pie in the Bahamas. We walked around, asked a few people and eventually found Vernon’s Grocery. At first, I thought my friend was playing a joke on me because this place is strange. The town’s grocery store is operated by Vernon himself, and he was either having a bad day or did not appreciate our company 🙂 Maybe, that is the charm the place? He is very clear on what to expect of his establishment. We went in hoping that Vernon’s was open, and we could buy that famous key lime pie. 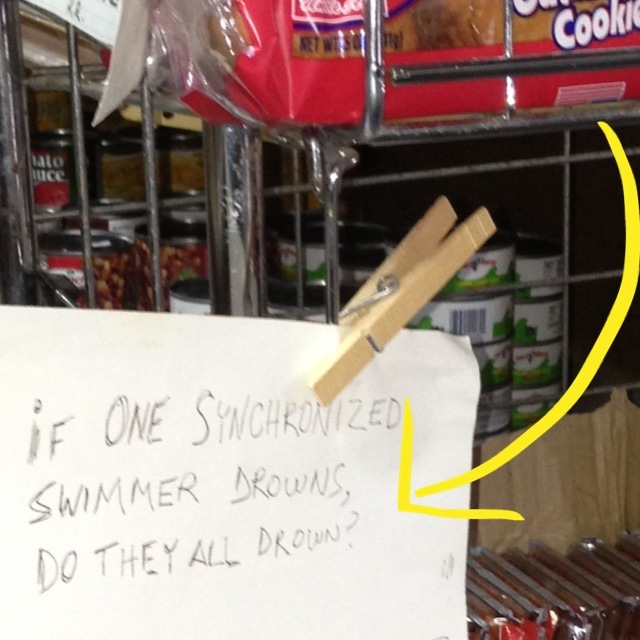 Apparently, Vernon has a dry sense of humor because he posts quotes all over his store. I’m not sure what to make of the sign above the oatmeal cookies but here ya go. I can confirm that Vernon’s key lime pie is one of the best that I have ever had so Vernon’s quirky grocery store makes my list of places to go in the Abacos. Oh yeah, he gives away free stuff too. 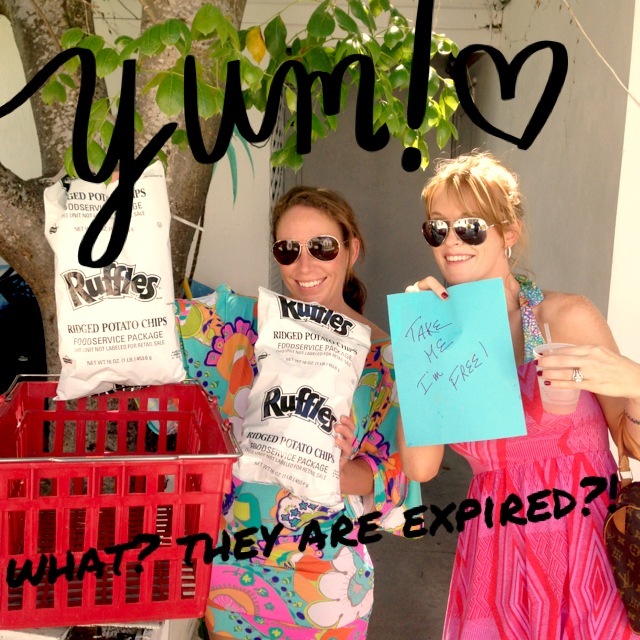 These Ruffles came in handy late one night and the expiration date did not not bother us one bit. Hope Town is charming and it is fun to just walk the streets and stop by many of the local shops. Also, check out the Hope Town Lodge. There is a beautiful ocean front restaurant and bar. 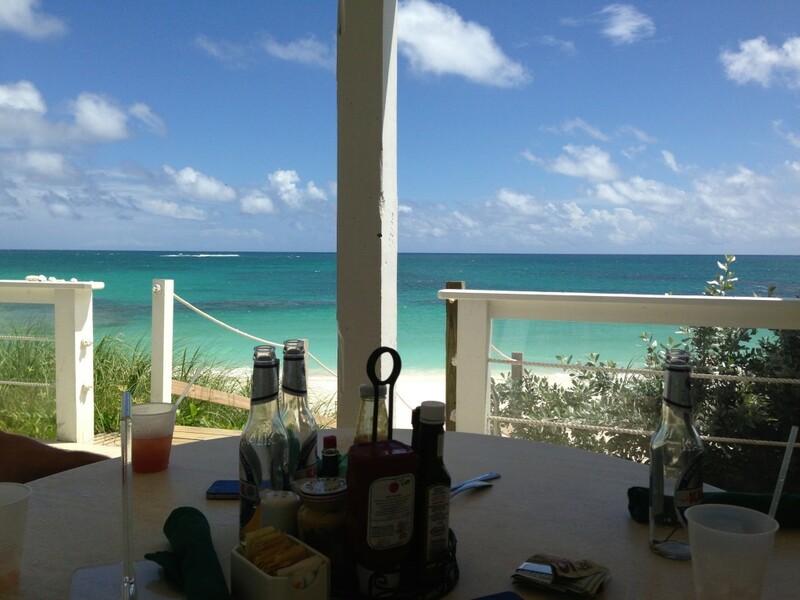 Again, we hear that many celebs have graced this local spot in the Abacos and we now know why! Gary at the Hope Town Lodge bar told us that Leonardo “Cappucino” had been there several times. We heart that Gary does not know Leonardo’s real last name. Also, make sure to have lunch and/or dinner at the Firefly Sunset Resort in Hope Town. 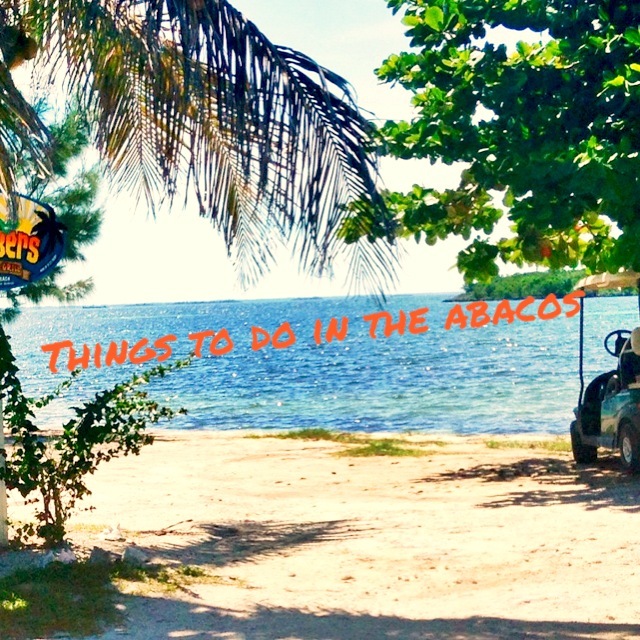 The restaurant sits right on the Sea of Abaco so it is an easy spot to visit by boat. We had 3 of our 4 dinners at the Firefly Sunset restaurant, so there ya go! Guana Cay was another one of our favorite Abaco Islands to visit by boat. 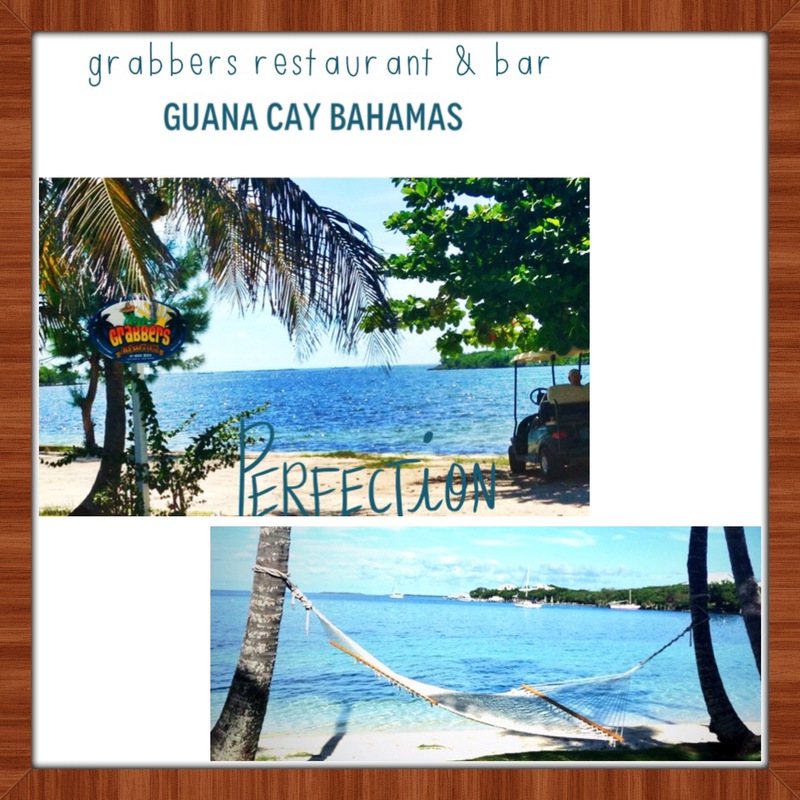 There are two famous restaurants and bars on Guana Cay, Grabbers and Nippers. Go to Grabbers if you want to relax on the beach, and go to Nippers if you want to party. We preferred Grabbers over Nippers, but one cannot skip a visit to Nippers if you are on Guana Cay. Nippers is famous for their Sunday Pig Roast which we hear turns into a rowdy party. 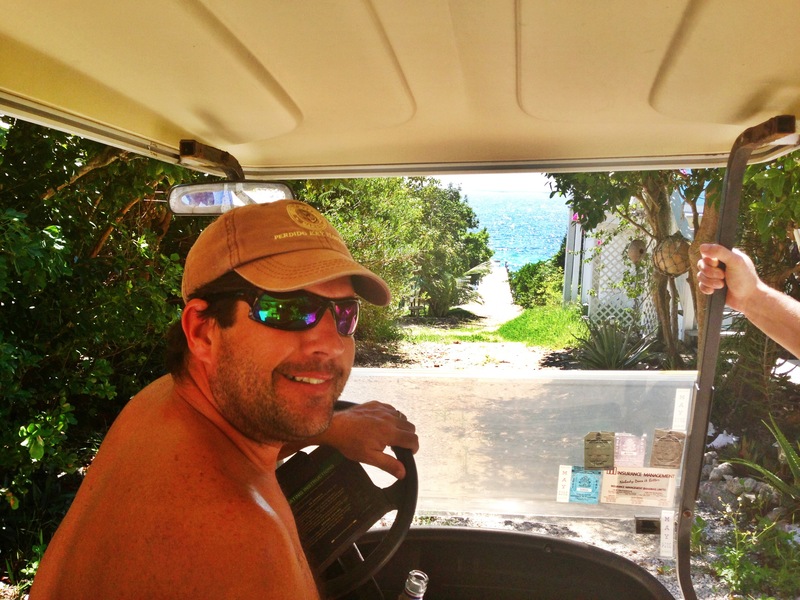 We also rented a golf cart in Guana Cay to tour the island. This was an inexpensive and fun way to see more than just the restaurants and shops. We even found a water front lot that has our name written on it! I seriously could retire in the Abacos on this little lot. 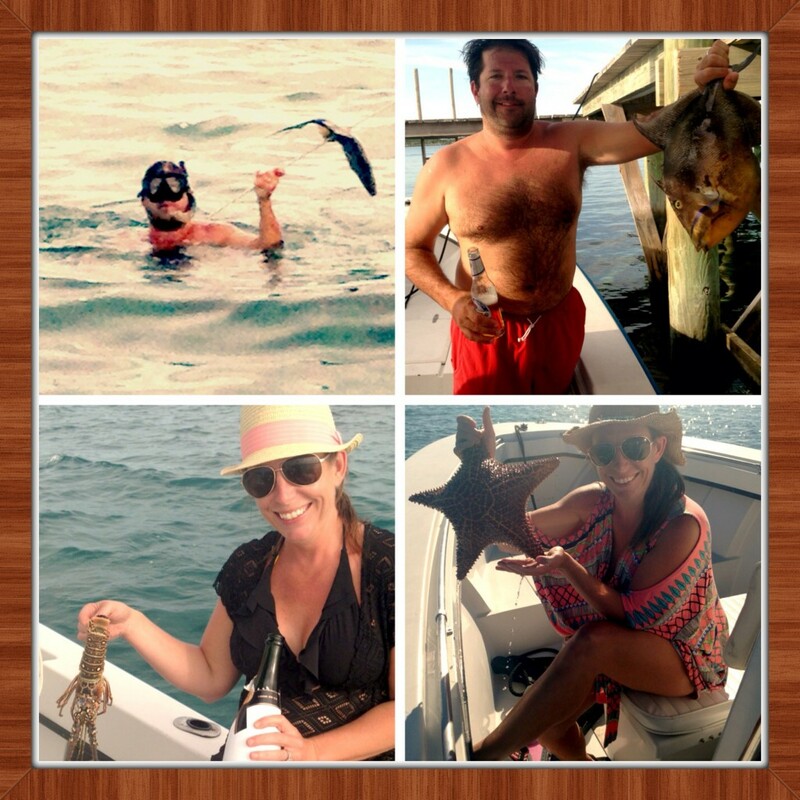 We participated in all three of these Abacos sports and enjoyed them with one caveat. Spear Fishing is not for the faint of heart. If you don’t believe me then read my article on Spear Fishing in the Abacos. The Abacos is the REAL Bahamas and there is not a single cruise ship in sight which is reason enough to plan your next vacation in the Abacos. Hi Tamala. Fantastic post! 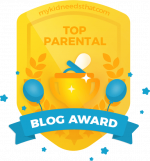 I really enjoyed reading about your trip to Abacos. Great photos too. It looks like you had a real, authentic experience in the Bahamas. 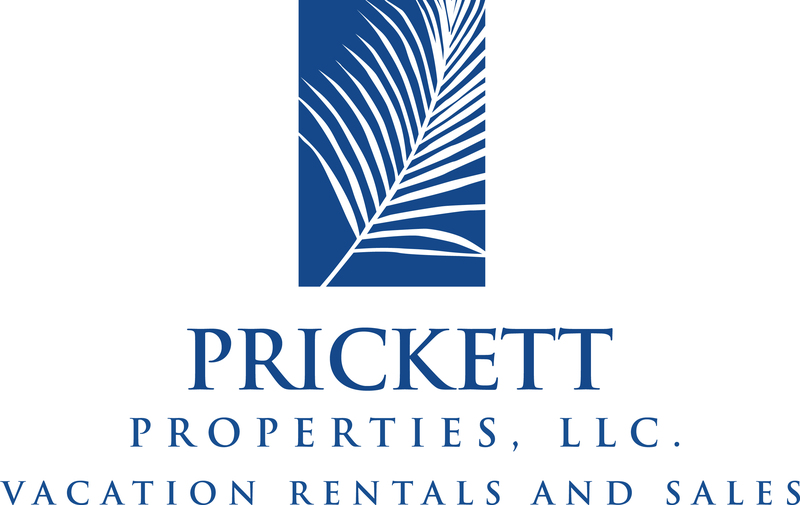 Nice post, i have shared on our Facebook page, next time come check out our villa Rumrunners on Great Abaco, a great base to explore the islands from. We have been travelling to the islands for over 10 years from the UK and have totally fallen in love. http://www.rum-runners.com or search on Facebook. Happy travels!